As a New Year approaches there are many things that may come to mind. One its a blessing to make it to another year and the other thought, is that this up coming year will be better than the last. Even if 2017 was a good year for some there are a lot of things, that each of us could have or should have done better. All of us could have made better choices, avoided making the same old mistakes and took advantage of the chances or opportunities that was given to us. That's why I am encouraging anyone who happens to read this to Move Forward and while they are doing this they must always leave their past behind. What I have learned in my 53 years on Earth, is that no one can change ones past and they only have control over what's in front of them. Yesterday is gone and the present or tomorrow is right in front of us. My mother would always tell me now that you know better, you should do better and my Pastor would preach this word on some Sundays, that one should never punish themselves for past mistakes because none of us are perfect. Like my late grandmother would always say, bring on the new, get rid of the old and leave the negative feelings, thoughts or people behind. A New Year is another opportunity to go after ones dreams, desires, to correct ones wrongs and to try too do what's right. 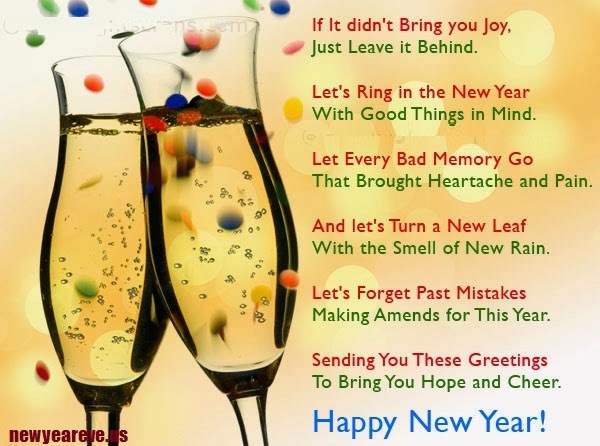 Its time to Move Forward into a brand New Year.